What has four legs and goes “boo”? — A cow with a cold. In the trade we call this phenomenon denasalization. And with that thought (no rude remarks about cow dialects, please) this blog takes a Christmas and New Year break. Back on 5 January 2009. The word captured my attention when I heard it in a TV clip about a man with a three-storey Christmas tree. (The clip is available here, though probably only for a few days.) The house-owner uses the word at about 00:49 and 01:30, and pronounces it in a way we might represent as ˈbɔːboːz. It sounds to me as though the second syllable is exactly as he would pronounce balls, e.g. in footballs. This leads me to speculate that for him, as perhaps for some others, the word is perceived as a compound of ball (since it is after all a kind of ball). This implies that for him the reflex of THOUGHT plus l has fallen together with the reflex of syllabic l. So Southall would end just like brothel, and bradawl would rhyme with saddle. I think exactly the same must have happened for those whom I sometimes hear pronouncing footballer with -blə. If juggle ˈdʒʌgo gives us ˈdʒʌglə juggler, with the l syllabic or possibly not, it becomes logical for football ˈfʊʔbo(ː) to give us ˈfʊʔblə in just the same way. For me, jackal doesn’t rhyme with tackle. But for some people it does. Even people of my advanced age have heard of a singer called Beyoncé Knowles. I don’t know anything about her other than that she has a silly name, but I thought I had better include that name in the recently revised edition of LPD. So I did, giving the pronunciation that I had heard around me. But after publication I found that according to an official-looking biography of her on the web this may be wrong. Her name is supposed to rhyme with fiance. Unfortunately, it’s far from clear what that means. According to the preference poll I quote in LPD, just under half the speakers of AmE think that fiance (fiancée) should have penultimate stress, fiˈɑːn(t)seɪ, while slightly more than half think it should have final stress, ˌfiːɑnːˈseɪ. So is she biˈɑːntseɪ or ˌbiːɑːnˈseɪ? We solved the question of Linux by finding a clip of its inventor pronouncing the name of his invention aloud (blog, 18 June 2007). Does anyone know of a clip of Beyoncé pronouncing her own name? PS Of course someone did! Thanks to Pedro Oliveira for this clip, where at about point 0:44 Beyoncé pronounces her own name with penultimate stress. She says biˈɑːnseɪ. I've been trying to find an epsilon with a tilde over it, and [have found a web page that has one]. The only quibble I have is that the tilde juts out to the right of the epsilon instead of being centered directly over it. I noticed on that web page the statement that 'ISO and Unicode have established that all diacritics should follow the base character, and this principle should be applied in future work.' Nonetheless, I would strongly prefer to have this tilde centered over the character, as I have normally seen it over other characters (e.g. over 'n' in Spanish, or over vowels in Portuguese). 1. Do you know of any way I can achieve an epsilon with the tilde centered over it? 2. If there's no answer to question 1, can you satisfy my curiosity as to why ISO and Unicode have established this decree? Your ability to "find" an epsilon with tilde depends not on finding a particular website, but on your installing suitable fonts and having a browser/word processor with suitable rendering capabilities. This applies particularly to the correct centring of diacritics. If you are having difficulty "achieving" this character, it sounds to me as if you ought to install newer software. Since there is no separate Unicode symbol for this character, it will always be encoded as U+025B U+0303. 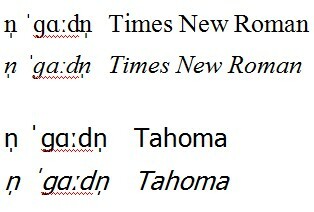 Try out different phonetic fonts, on a recent browser or word processor, until you find one you like. You had better ask Unicode why it chose the order of base + diacritic. But it has been fixed for over 15 years. I later realized that Mr Todd had misunderstood the Unicode “decree”. It refers to the ordering of the codings for the base symbol and the diacritic, not to their rendering on a screen display or on paper (for which, of course, most diacritics ought to be exactly centred). In the sidebar you can see the outcomes for some of the phonetic fonts I have on my computer (NB older versions of some of these fonts do not include IPA symbols). This is a screenshot of how they appear on my computer when displayed in a Microsoft Office Word 2007 document. You can see that all the fonts except the two Lucidas, Charis SIL and Gentium centre the diacritic properly. Unlike the other fonts, these four presumably do not incorporate the necessary software routines to achieve proper centring over wide and narrow base characters alike. I have to say that all the non-centred versions except Charis have the diacritic jutting out to the left, not to the right as Mr Todd claims. These are scalable fonts. If you would like to inspect this character in a larger size, or in a printout, look at this pdf file and enlarge it as you choose. The more you enlarge it, the sharper it will be — unlike old-fashioned bitmapped characters. 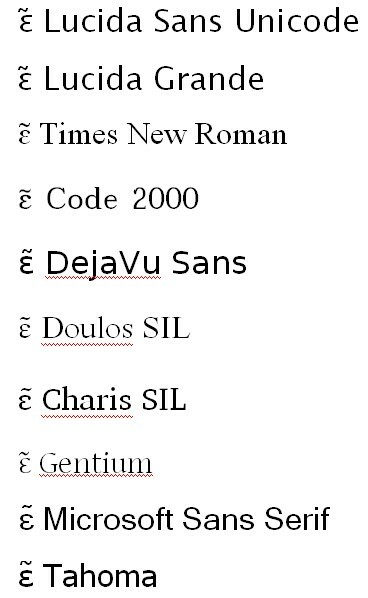 Jarek Weckwerth claims that Times New Roman (Vista version) is actually the best phonetic font, because it alone knows that even when italicized the IPA stress mark and syllabicity mark should both remain vertical. It’s true: see alongside. Not only can we listen to the story (or tuori), we can also read the subtitles. They are in the special phonetic spelling devised for JC by Fred Cassidy (slightly modified: see blog for 13 August 2008). Those campaigning to have JC given proper recognition in the Jamaican school system and elsewhere have adopted this spelling and want it made official, partly no doubt to bring out the difference from Standard English and to underline the claim that JC ought to be regarded as a separate language, not as a crippled form of English. The caption in the picture above reads Den di Ienjel tel ar se: "Mieri no fried, yu speshal kaaz a yu Gad pik. ", which means Then the angel told her, "Mary, do not be afraid, you are special because it was you that God picked". At first it is confusing to have the spelling ie denote the FACE vowel (rather than the PRICE or FLEECE it would stand for in standard spelling). But this exactly reflects the Creole pronunciation, with a close-to-mid front opening diphthong. So ienjel = angel, Mieri = Mary, fried = (a)fraid. Interesting grammatical points just from these two lines include the use of se (from say) as a complementizer or to introduce a direct quotation, fried (from afraid) as a verb, ‘to fear’, rather than an adjective, and the use of a as a topicalizer (a yu Gad pik = it was you God picked). The ignorant view is that JC (or “patwa”) has no grammar. The linguists have shown that it does of course have grammar, but a different grammar from that of English. Judy Gilbert tells this anecdote about speakers’ self-deception. A friend of mine gave a lecture about the subject of ESL to a regular university English class. When he finished, the regular teacher said "That was quite an interesting explanation, but in relation to your point about contractions, I actually don't ever use them myself." He told me that the class began to giggle at that point and he didn't think that the teacher ever forgave him for the embarrassment. I think that linguistically naive persons, especially highly educated ones, really do believe they speak like a book. One of the major advantages of phonetic transcription is to clearly indicate otherwise. One can only say “Hear, hear”. And it’s not only about their own speech that people have false perceptions. Does the Queen ever use glottal stops? Oh no, someone claimed, the Queen speaks RP, and you never have glottal stops in RP. Listen again to the YouTube clip we were discussing just recently. There may not be any intervocalic T glottalling in her speech. But there is masking glottal reinforcement of final /t/ at 0:37 great things, 0:44 great challenges, 0:50 celebrate the, of final /p/ at 0:11 help change, 0:33 develop the, and of final /k/ at 0:56 like briefly and 1:04 public life. This is entirely typical of RP speakers, even very conservative ones.